In 1949 Bill Ruger introduced his first firearm, the Standard Model .22 semi-automatic. 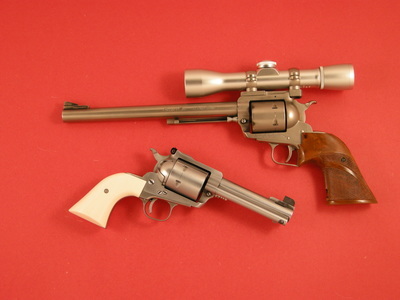 It became an instant success and he soon offered Target Model versions with adjustable sights. 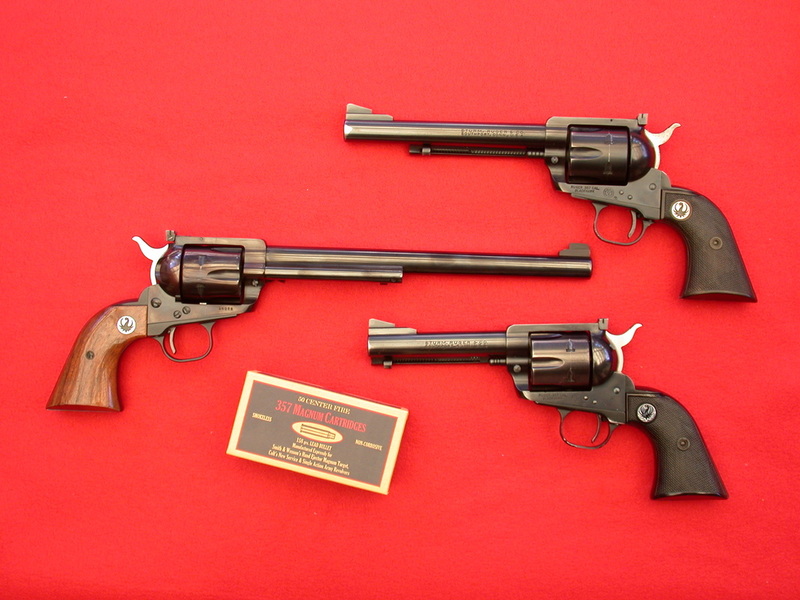 Ruger followed this ongoing success with his first sixgun, the .22 Single-Six in 1953. Both of these .22s have been excellent sellers since their introduction so many years ago; they have both been proven to be accurate and totally dependable. Now it was time for Ruger to really reach out. 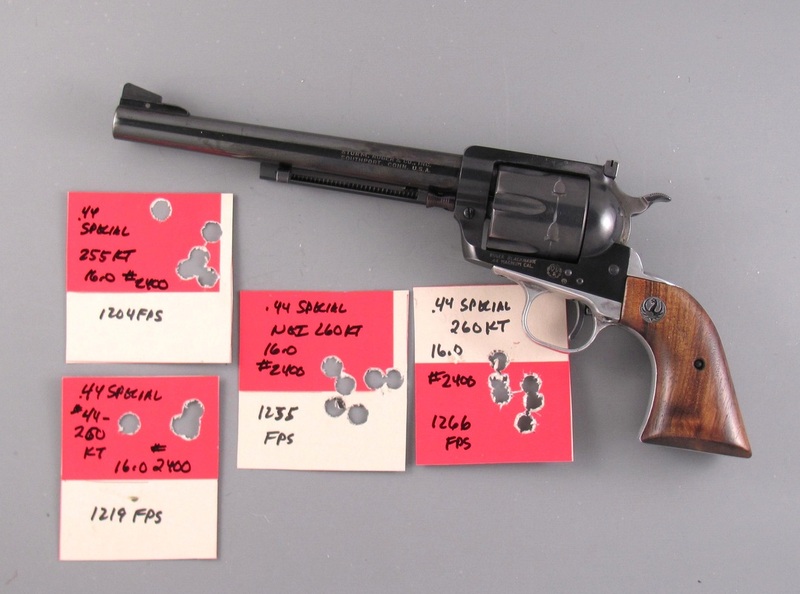 The .22 Single-Six had been fashioned after the long gone Colt Single Action Army, however Ruger decided it was time to go centerfire. 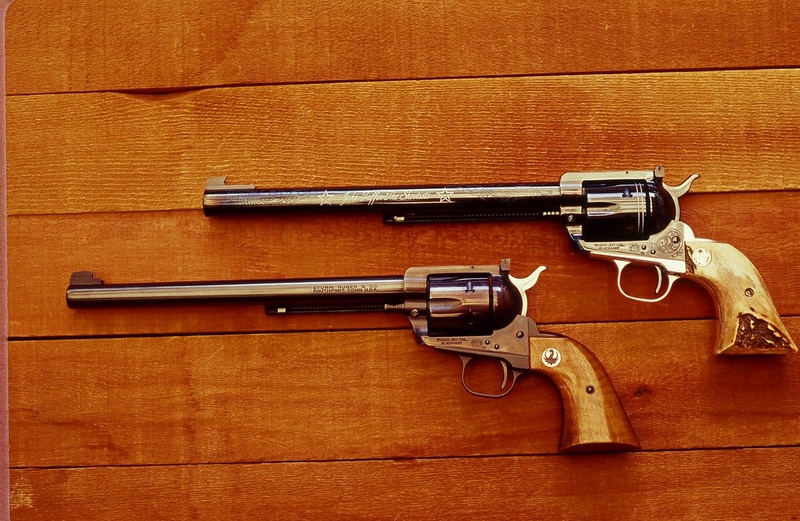 Practically speaking, if not spiritually so, Ruger was ready to bring out a centerfire single action sixgun which would prove to a better choice for most shooters than the old Colt. Ruger was about to have his third major success. 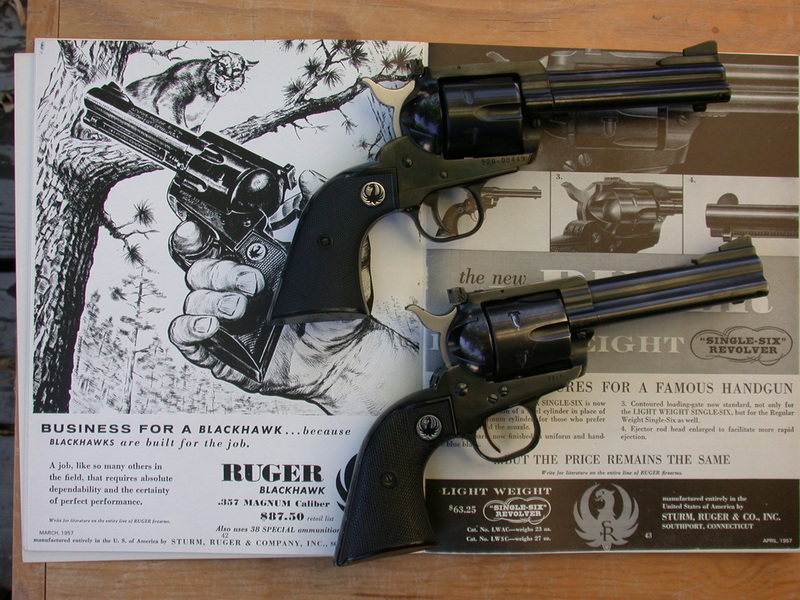 1955 Ruger .357 Magnum Blackhawk and early advertising. 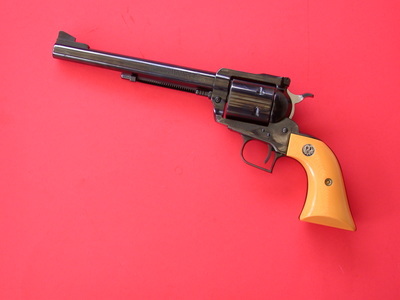 My first sixgun was a Ruger .22 Single-Six in 1956 and it was soon followed by a 4-3/4” Colt Single Action Army going back to the beginning of the 20th century and chambered in .38-40. It was a beautiful sixgun, as they say used but not abused. 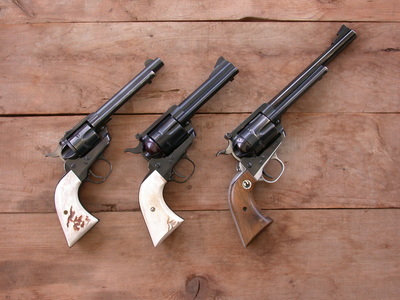 It was also tremendously expensive to shoot as I had not yet become a handloader. 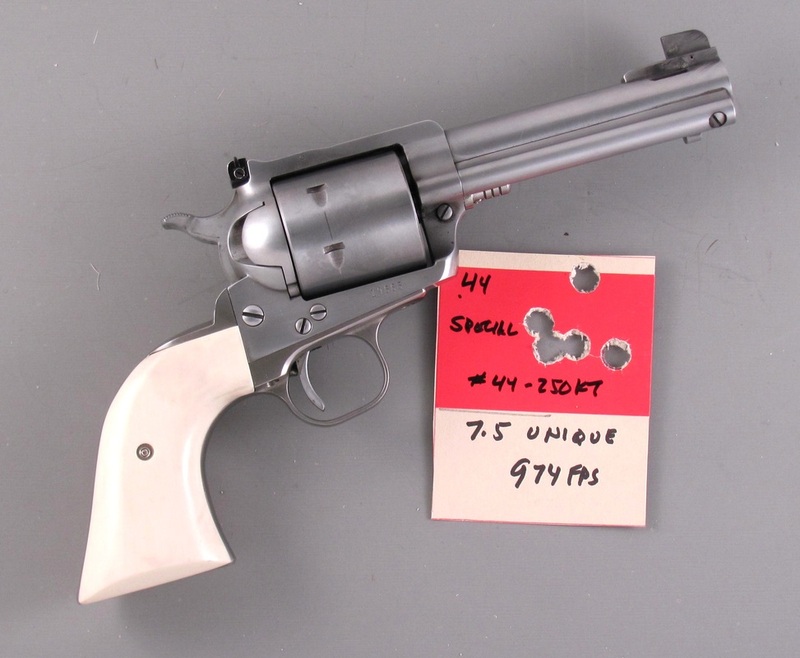 When I saw the first .357 Blackhawk in late 1956 I bought it immediately. It was difficult at the time to find .357 Magnum cartridges or brass, however we were at the height of Bullseye shooting so .38 Special brass was not only easy to find but also very inexpensive. I picked up a Lyman/Keith #358429 single cavity mold and became a bullet caster and handloader with the same sixgun. Thousands of heavy .38 Specials using Keith’s bullet and his recommended load of #2400 were shot through my 4-5/8” Blackhawk. 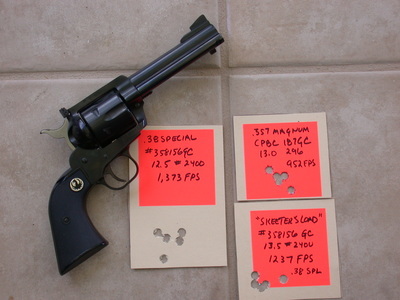 This sixgun is still operating a perfectly today and still sees more heavy .38 Special loads that it does .357 Magnum. 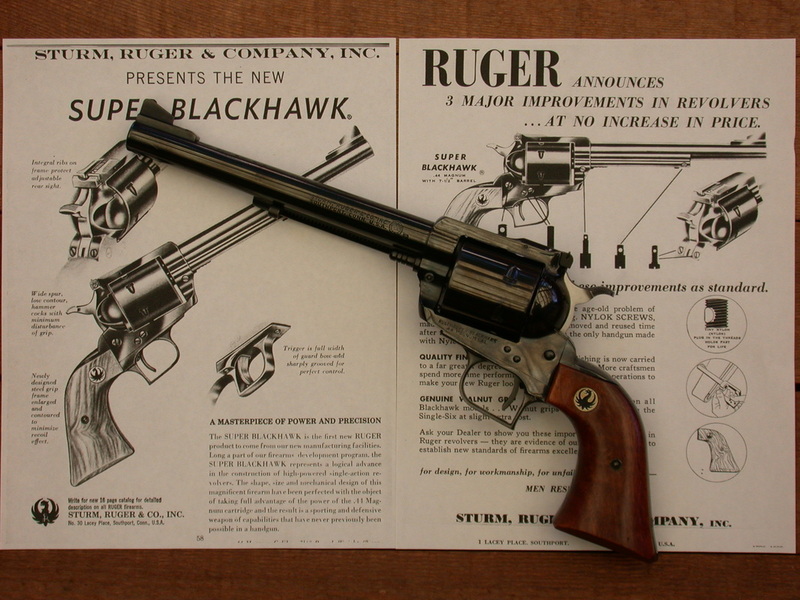 Ruger soon added a 6-1/2” barreled .357 Blackhawk and then, though very rarely, a 10” version. I am very blessed to have examples of all three plus I made up the version Ruger missed by having a 6-1/2” cut back to 5-1/2”. You will notice also there was no 7-1/2” .357 Blackhawk. Skeeter Skelton made one up by cutting back a 10” .357 before we knew how rare it was. I have several 10-1/2” takeoff barrels from the Ruger .357 Maximum and I will be using one of them shortly to come up with a 7-1/2” Blackhawk. 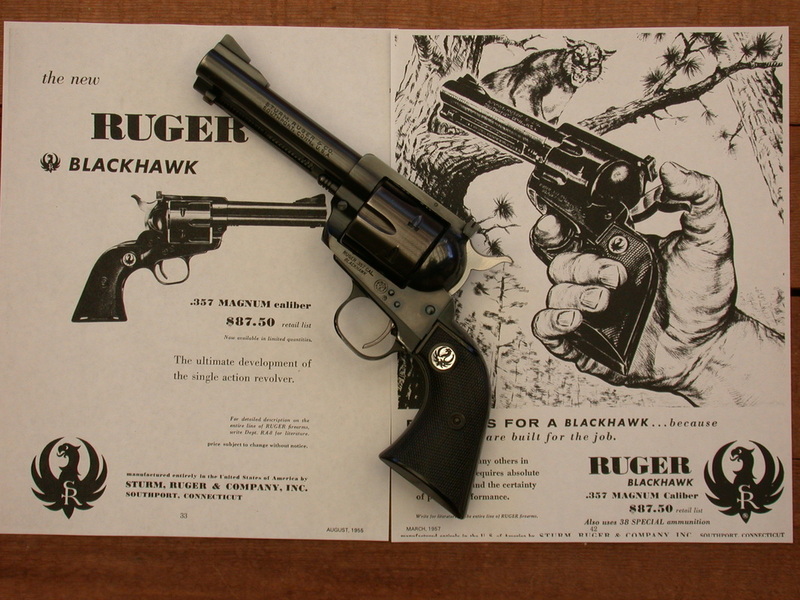 In 2005 to celebrate the 50th anniversary of the first Blackhawk, Ruger came out with what is virtually an identical version of the 1955 Blackhawk although it is built on the New Model frame. 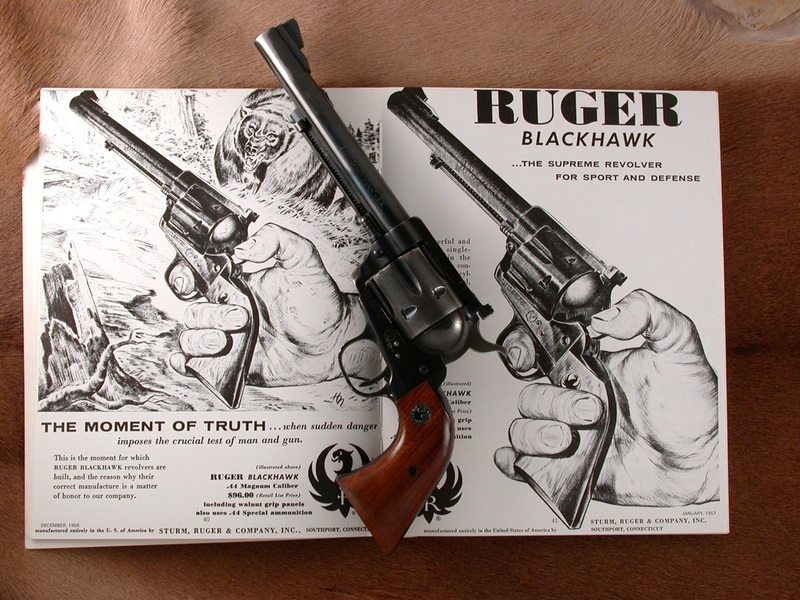 More on the New Model shortly but right now it is enough to say this 2005 New Model Flat-Top Blackhawk which is the same size as the original and also with the same size grip frame opened whole new windows for Ruger Single Actions. 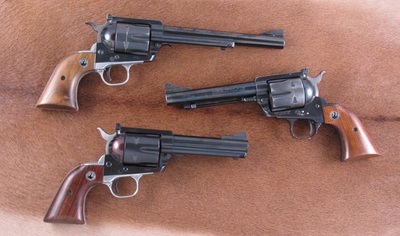 Elmer Keith shared with us that the original .357 Magnum Blackhawk would soon be offered in both .44 Special and .45 Colt. However, as so often happens, something occurred to change things drastically. Bill Ruger was given a sack of fired cartridges. There are several stories attached to just where these came from but suffice it to say for our purposes those cartridges changed everything. 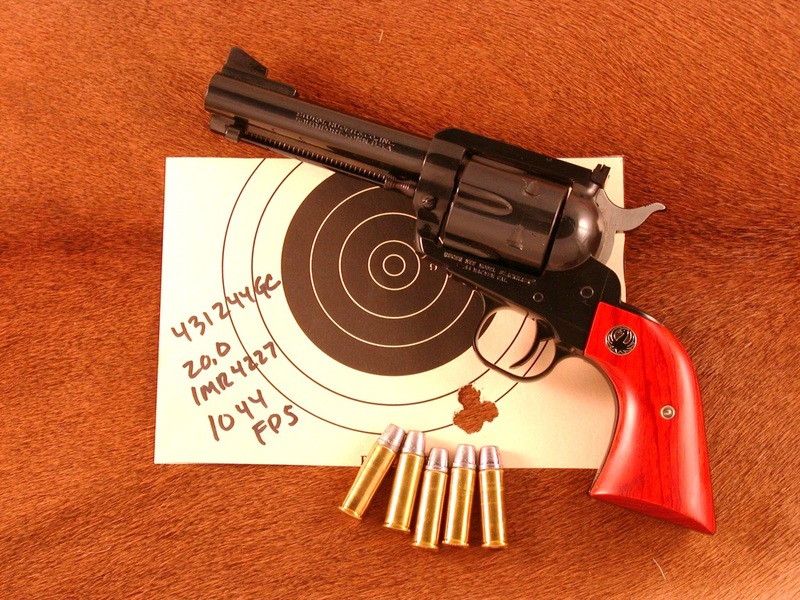 For the first time Bill Ruger saw the new cartridge case which would be the .44 Magnum. Ruger went right to work chambering and re-barreling his .357 Magnum Blackhawk to .44 Magnum with three prototypes being made in 4-5/8”, 5-1/2”, and 7-1/2” barrel lengths. Elmer Keith told him the frame was too small and he was proven to be right as further proof testing saw one let go. So it was back to the drawing board for Bill Ruger with the frame and cylinder of his .357 Magnum Blackhawk being enlarged to become the .44 Magnum Blackhawk. These were all offered with 6-1/2” barrels and I remember reading in an article by Lucian Cary of the “fact” the Ruger .44 Magnum would be easy to handle as it had the same grip frame as the Colt Single Action Army which everyone knew just rolled up in your hand. Of course, Cary had never fired a .44 Magnum, however I believed him and bought the first .44 Magnum Ruger Blackhawk to arrive in my area in the winter of 1956/1957. I’ll never forget firing that first round. The grip frame rolled up in my hand all right and didn’t stop until the back of the hammer cut a gouge out of the back of my hand. So much for the easy shooting .44 Magnum. The Colt grip frame works fine up to a point, at least it did when I was 17 years old. 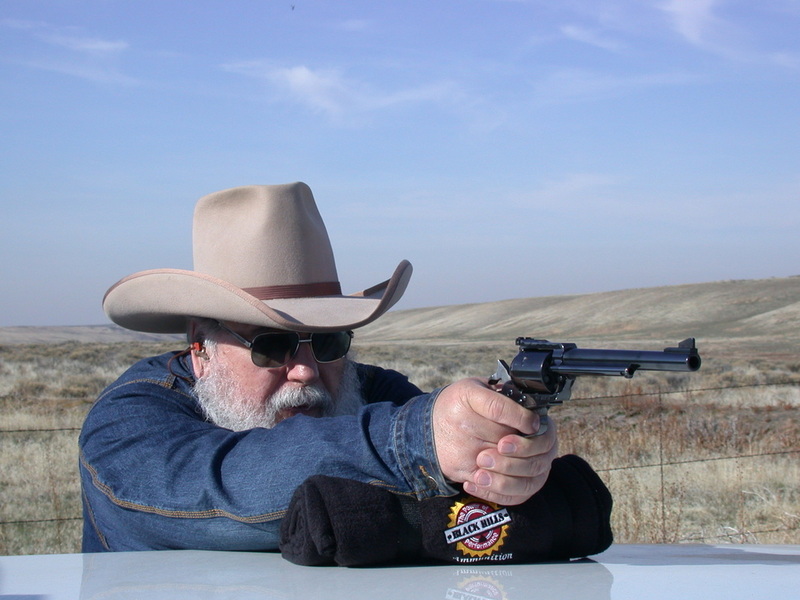 I learned, however it took quite a while, to handle the recoil of the .44 Magnum in that first Ruger. Over the years I had the barrel cut back to 4-5/8” and carried it that way for at least 10 years and then returned it to Ruger for the installation of a 7-1/2” barrel. It still wears this longer barrel and after all these years it is still one of my favorite single actions although, since both the Blackhawk and I are much older, it mostly sees heavy .44 Special loads. 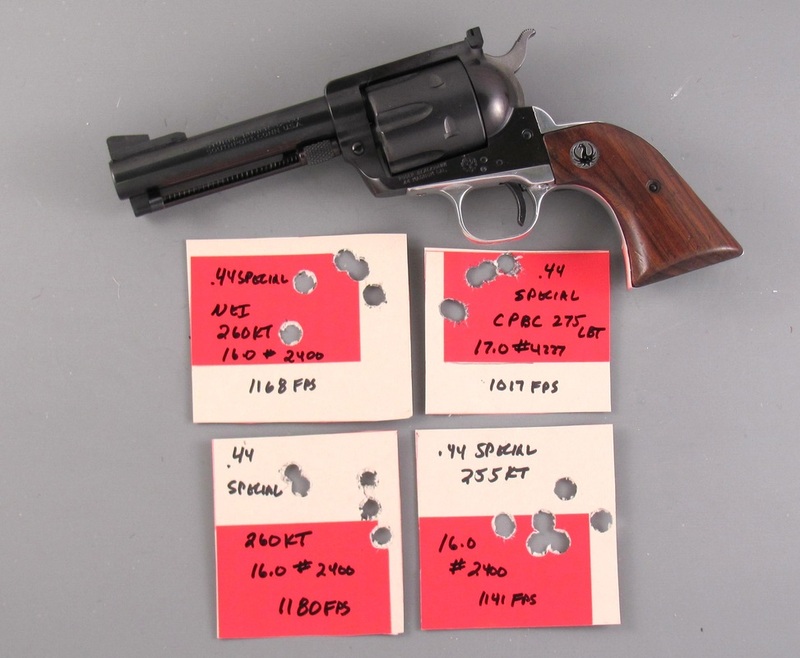 Ruger made about 25,000 of the standard barrel lengths while the 7-1/2”and 10” lengths are quite rare with about 1,000 each being made. 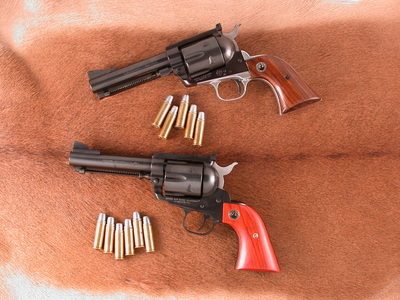 I have made up a couple of special Ruger .44 Magnum Blackhawks with 4-3/4” barrels making it an absolutely exceptional Perfect Packin’ Pistol. Ruger followed their 2005 50th Anniversary Model .357 Magnum Blackhawk in 2006 with the Anniversary Model of the .44 Magnum. Just as with the originals these had 6-1/2” barrels and I immediately changed mine to a Perfect Packin’ Pistol with the installation of a 4-5/8” barrel. I was not the only one to have trouble with recoil shooting the original .44 Magnum Blackhawk and Ruger received several requests to improve it. The debate is still out whether or not it was actually improved but it was changed and it certainly made many shooters happy. 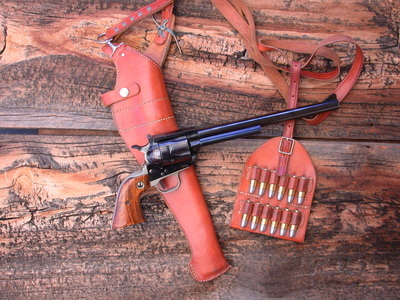 Starting with the original .44 Magnum Blackhawk, Ruger increased the barrel length to 7-1/2”, added a little more weight by going to an unfluted cylinder, and then the most radical change was replacing the aluminum alloy Colt SAA-style grip frame with a steel grip frame patterned after the Colt Dragoon of 1850. This grip frame is longer than standard and also the back of the trigger guard is squared off. Most shooters find this grip more comfortable, however the back of the trigger guard always catches my middle finger with any loads much higher than standard factory original .44 Special loads.